When I was in elementary school, my class did a unit and we were asked to bring in our family tree. My Mom and I spent hours and hours over several days writing in the names on a pedigree chart to bring in. Even though the teacher was really only asking us to write up a family tree with our parents and grandparents, I have very fond memories of working on this project. My daughter is starting a similar unit at school and she wanted to see her family tree. If you are interested in generating a fan chart like this for yourself or for one of your kids, here is some info on how to do it. I am a Mormon and family history is kind of a big deal to us, so I have benefited from work done by family members and my chart is almost full. If you are just getting started on your family history work, you can print off your chart with the information that you have now and fill it in as you work. If you haven't done any family history work yet, I highly recommend starting with familysearch.org; it is free and has amazing resources. 1. If you do not have a familysearch.org account with your information saved in it, you will need a GEDCOM file with your family history. This is the type of file supported by most genealogy programs, including Ancestry.com (directions here). 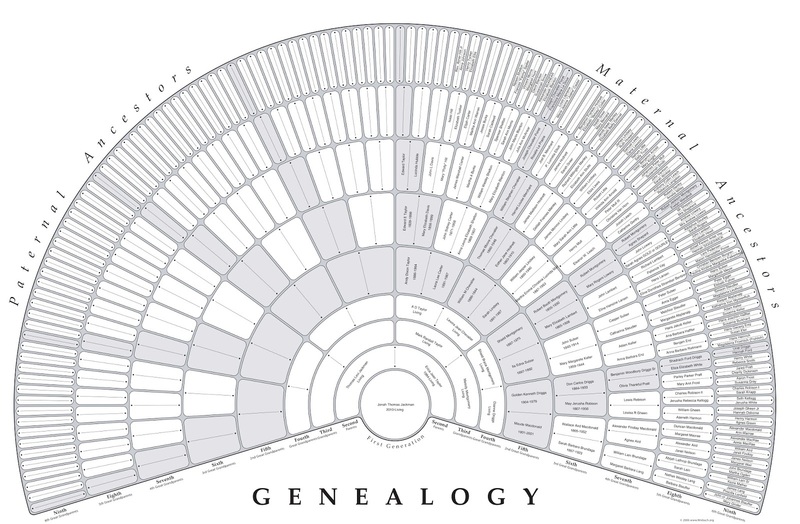 You can actually generate a chart like this directly through Family Search, but the largest size it offers is 7 generations. 2. Go to treeseek.com. From this website you can either login to your Family Search profile and download your information into a variety of charts (I used the 9 generation black and white chart) or you can upload a GEDCOM file without having to login. 3. Pick the person whose chart you would like to generate. It should give you the choice of you, your parents, or your kids. 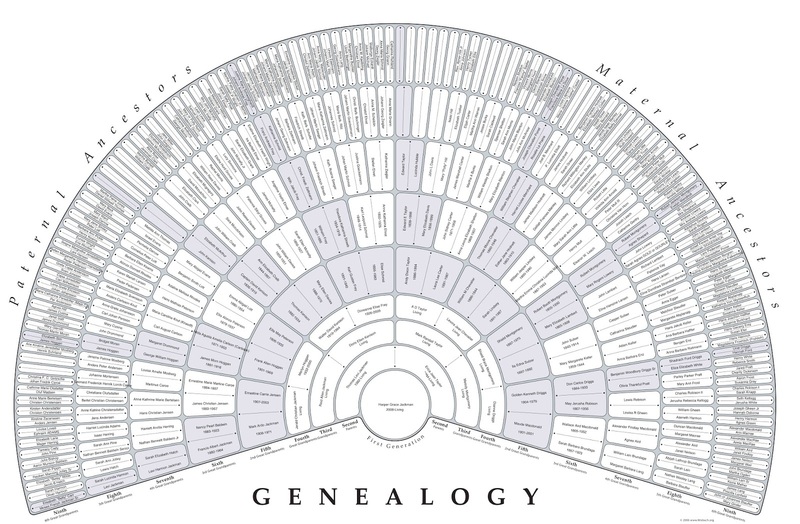 Note that if you are making a chart for one of your kids and you are logged into your Family Search account or are using a GEDCOM file with your family history on it, only half of the chart will be generated. If your child is older than 8 (mine aren't) they can have their own Family Search account. If you are making the chart for yourself or for one of your parents, you are now done! Skip down to step 6 for printing info. 4. Once you have generated a chart that has your child's name at the base and half of their family history on it, login your child's father's profile and generate the same chart. This should look just the same, except it will have information on the left instead of the right. 5. Merge the images. I'm sure there are multiple photo editing programs that are capable of this task, but I used Photoshop (and honestly this is so easy to do that if you just email me the files I can do it for you). If you are using Photoshop, open both files (they are PDFs) side by side. Hold down the shift key and drag one of the images onto the other. Holding down the shift key centers the image when it is moved and since the image are the same size, it should line up perfectly. Select the eraser tool and erase half of the image so that the information underneath will show through. Save the finished images as a JPEG. 6. Print the image. I used the Engineering Print option from Staples. My charts are 24" x 36" and cost a whopping $3. I hope that wasn't too confusing because the process was really not difficult. If you have any questions or if you are interested in learning more about family history work, please let me know! Thanks so much, I am going to give this a shot! This is really neat! Parts of my family were diligent about recording their ancestry for future generations. Others, not so much. 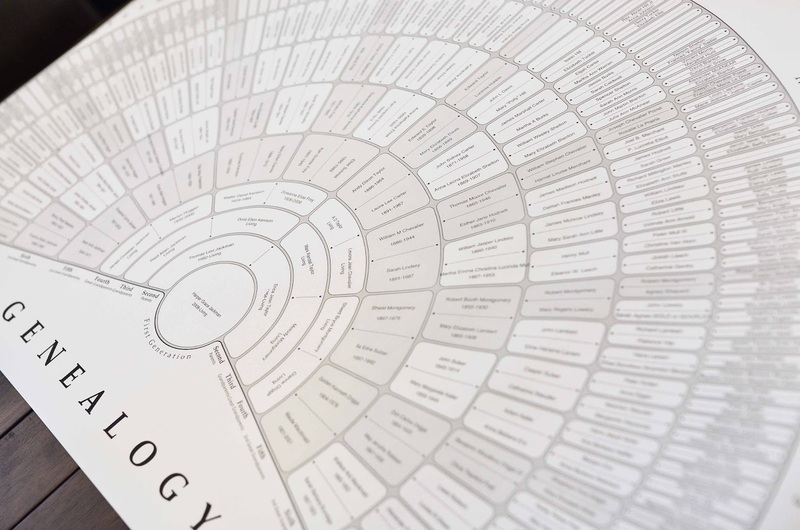 As a result, branches of my tree go back 7 generations (usually to "the old country"!) And others are completely bare. I always did if I won the lottery, I'd hire someone to help me with that research. 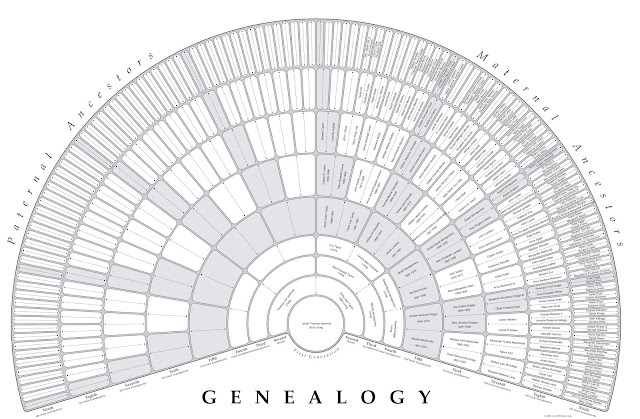 I have used Family Search and some other sites , but I have never stsrted a family tree on any site yet .guess I m afraid to so . Do you know if it is possible to get one of these charts blank , to fill in the names yourself. Looks fantastic . I'm tech challenged but want to try this. Thanks for this info! This is awesome! Thank you! I have been wanting to do this from my Family Search account, but could never figure out how. I will give this a try. You have got me keen again seeing yours done. I have had a family search account for many years and have never printed it out. You have definitely inspired me. Might need more of your help though! This is very very very good. I love the printable sheet. My dad made our family tree something like this, but he traveled all over the world bc all of us are from Holland. Ours dates back to 1626 on both of the sides of my grampas DeLeeuw and Straaijer. Yours looks very good. How nice to have this.